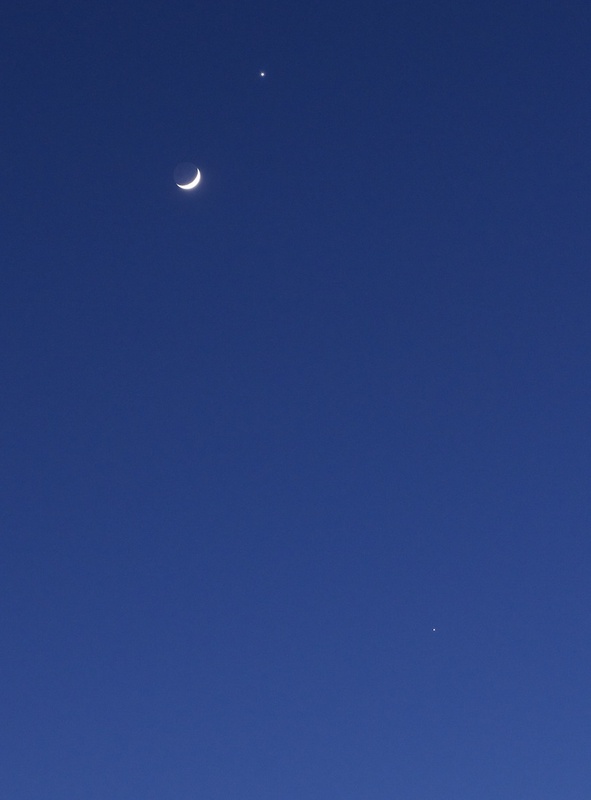 This photo of the crescent Moon, Venus (above) and Jupiter (below) was taken on 26th March, around 8 pm. What makes it even more special is the ethereal phenomenon known as Earthshine. Earthshine is the faintly illuminated ‘dark’ part of the Moon, which is not lit directly by sunlight. Instead, it’s lit by reflected sunlight from the Earth. The best time to observe Earthshine is when the Moon is a thin crescent, either while it’s new in the evening, or an old waning Moon at sunrise. For some reason that isn’t yet properly understood, it is much more noticeable during the months of April and May. The phenomenon was first explained by Leonardo da Vinci in the first decade of the 16th century. Cloud cover on the Earth reflects more sunlight than land or sea, although snow and ice reflect up to 90% of sunlight back into space. Earthshine is also known as ‘the Moon’s ashen glow’ or ‘the old Moon in the new Moon’s arms’. Comet ISON: just HOW bright? That’s a shame – try again tonight, and I hope it’s clear. I was looking at this just 2 nights ago!